If you are looking for a comfortable pair of yoga leggings, look no more! These are the best that I have seen. 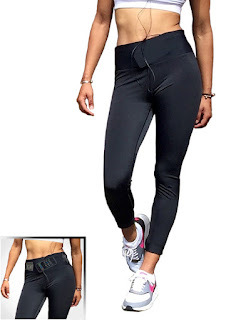 They have an extra wide top that not only makes it way more comfortable, it also prevents "muffin top" from happening. If you have bent over and everyone can see right through your pants, they can't with these. That is such a great thing. Almost every yoga leggings that I have reviews, have been see through. The material is 73% nylon, 27% spandex, making it perfect for all kinds of different type of workouts. Not just for yoga. These are perfect for running, workout, biking, training, competing, any sports. You don't have to worry about your legs rubbing together and hurting because these are chafe proof. Super easy to care for. You just wash them and let them hang dry. They keep their exact comfortable shape. There are two slits inside the waistband that you can keep your phone, keys, or money in. These are not your normal yoga leggings. These are top of the line, super quality, long lasting ones. If you want to feel comfortable and want the best in leggings, then, these are for you! I received this product for my honest and unbiased opinion. I am a huge fan of these. They are AWESOME!